Now that you understand everything in the world about drawing the Lewis structures of most covalent compounds and polyatomic ions, you probably think you’re done. Well, sorry to hit you with the bad news, but you’re not. You see, you still have to learn about something important – the idea of resonance structures. Once you know that, you’ll be a super-pro at Lewis structures. There will still be more to learn, but you’ll be enough of a super-pro to survive your chemistry class. Either way, all of the rules were followed and everything is OK. However, let’s think about this for a minute. In the first structure above, the oxygen on the left has -1 charge and the one on the right bonds twice. In the second structure, the oxygen on the right has -1 charge and the one of the left bonds twice. It’s obvious that these two structures are both valid, but which one is right? If you take a look at this weird diagram, you can see various features which the other two have in common. For example, nitrogen has a lone pair in both structures, and you can see this lone pair on nitrogen in this mutant structure. Likewise, there’s an N-O single bond in both Lewis structures, and you can see this bond here. What’s weird is that each oxygen has a (-) on it and there’s a dashed line between N and O. The (-) symbol means that each oxygen has some, but less than a full, negative charge. The dashed line means that there’s a partial bond between the nitrogen and each oxygen. How can this happen? Simple: The actual structure of the nitrite ion is an average of the two structures that can be drawn from it. OK… this may not make a lot of sense right now, and that’s fine. You’re probably OK with the idea of each Lewis structure representing the nitrite ion, and you’re probably OK with the idea that the double bond can fit between the nitrogen and each oxygen atom. There’s nothing new with that, so the two Lewis structures at the top of the page both make sense. The problem comes when you do this averaging thing. Why can you do this averaging thing? What does it mean? Will my instructor make me generate something that looks like that for the test? Which, as you can see, is just the two Lewis structures you would have normally drawn, except with a double-sided arrow between them. The two diagrams shown are referred to as resonance structures. Resonance structures exist for molecules in which there’s more than one valid Lewis structure, and in which the atoms are all connected in the same way. In the case of the nitrite ion, both of these structures have a central N atom and two O atoms on the outside, so they’re said to be resonance structures of each other. It’s important to draw these resonance structures whenever you can because showing both of them indicates to others some useful information about reactivity. For example, if you look at only one of the Lewis structures individually, you may believe that only one of the oxygen atoms (the one with the negative charge) will be reactive and the other one will just sit around. By looking at both of the Lewis structures, you can see that both of the oxygen atoms will be equally reactive because they both have some of the negative charge. Yep, all the atoms are combined and no rules have yet been broken. Unfortunately, we have one more bond to add, and it pretty much has to be an N-O bond. But which oxygen will double bond to the nitrogen atom? I could put the bond between nitrogen and the oxygen atom on the left, and everything would be cool. I could put the bond between nitrogen and the oxygen atom on the right, and everything would also be cool. Which one do I do? When will I need resonance structures? When drawing resonance structures, this is the way in which you indicate the equivalence of all three resonance structures. Polyatomic ions: It’s not at all uncommon for polyatomic ions to have resonance structures. However, please don’t assume that just because something is a polyatomic ion that it must have resonance structures. 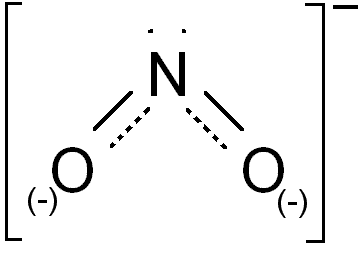 Whereas the nitrate and nitrite ions have resonance structures (as shown above), the hydroxide ion does not. Remember, you can only draw resonance structures when there’s more than one possible place the multiple bonds can be shown. Some organic compounds: In cases where you have an organic anion (such as the phenolate ion), it’s possible to have resonance structures. In the case or aromatic (or anti-aromatic) and conjugated hydrocarbons, you may also see resonance structures. Again, not all organic compounds will have resonance structures, so only draw them if you have some compelling reason to do so. The images in this tutorial are all in the public domain, as are all scientific structures and formulas. Use ’em without citing them and you’ll be A-OK!